The Man from Earth is getting a sequel. Willa Holland has some harsh words for DC over its treatment of Arrow and The Flash. Plus, teasers for the next season of Scream, new Star Trek Beyond posters, and more footage from Teenage Mutant Ninja Turtles 2. Spoilers Get! Kasdan: Oh, I think so! You know, Chris Miller and Phil Lord are going to direct it. They’re great, funny and imaginative and we’ve had a great time together. My son [Jon] and I wrote the script and Chris and Phil are working on it and they’re about to move to London to start shooting in January. And it should be fun. 2018 is the release date? Kasdan: Yes. They’re actually scheduled for May. 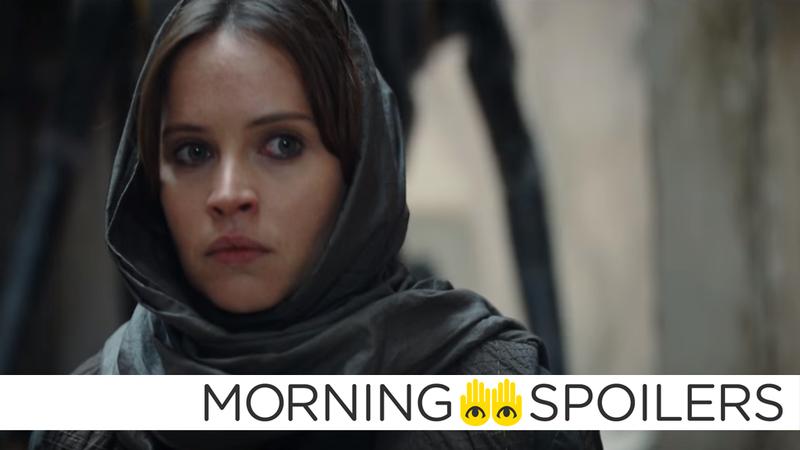 The [other Star Wars films] are falling on Christmas — Rogue One and Episode 9. Han will come before Episode 9. And now the bad: Page Six is reporting that Disney executives are panicking about the film, which is apparently not testing well in the cut director Gareth Edwards has provided, and are prepping expensive and intensive reshoots to take place throughout July. A source from Disney also told Page Six that reshoots were expected, citing a desire to ensure the film has the same quality as The Force Awakens. Whether it’s the good spin or the bad, take all this with a pinch of salt for now. David Ayer has shared a new picture from the film’s scoring session, featuring a shot of Harley Quinn in the background. To that end, what was your reaction to the first big victim of the season? Then when Stephen found out there was going to be a Justice League [movie] it only seemed — rightly so — he would be playing Green Arrow on it as well as that Grant [Gustin] would be playing the Flash. It seemed like the right normal answer, and — once they said no — you can’t really fight against them for it, because they are the people that gave us a job in the first place. So you just have to sit there on your hands, like okay, I get it! Marvel does it in their own weird right, kind of mash between Agents of S.H.I.E.L.D. and the movies and stuff. So it’s a little upsetting because you know it is possible and it can be done and how good it would be if it was done.